There are approximately 48 Eastern Orthodox churches in the area. As you can see in this map, most are located in more affluent areas, versus areas that are suffering from poverty. Interestingly, around the pocket of high poverty on the city's West side, Orthodox churches stand almost like outposts on the periphery. These churches, and those in other relatively affluent areas can be tying "scripture and service, and pointing members to tutor/mentor programs that already exist, or to neighborhoods, where new programs need to be created." Please take a look also at the blog entry for Chicago's Places of Worship for more information on why this is important, and on how faith communities can use the T/MC's strategies to increase the reach, frequency and consistency of tutoring and mentoring programs. And as always, please visit the T/MC website to get information about programs in all parts of the region. And, check out the T/MC Program Locator, or the Interactive Zip Code Map to find locations of programs that can use your volunteer or donor help. There are 164 Methodist Churches that we're aware of, and they are spread pretty evenly throughout the area. As you can see in this map, some are located in more affluent areas, and others are working in communities that suffer from high levels of poverty. Methodists in all these areas can be tying "scripture and service, and pointing members to tutor/mentor programs that already exist, or to neighborhoods, where new programs need to be created." Check out the T/MC website to get information about programs in all parts of the region. And, please head to the T/MC Program Locator, or the Interactive Zip Code Map to find locations of programs that can use your volunteer or donor help. There are at least 307 Lutheran Churches spread throughout the area city. As you can see in this map, the majority are located in more affluent areas, versus areas that are suffering from high poverty. Many are in the suburbs within a stone's throw from major highways that can bring commuting members past high-poverty areas. Suburban Lutheran leadership in these areas can be tying "scripture and service, and pointing members to tutor/mentor programs that already exist, or to neighborhoods, where new programs need to be created." Also, please check out the T/MC website to get information about programs in all parts of the region. And, visit the T/MC Program Locator, or the Interactive Zip Code Map to find locations of programs that can use your volunteer or donor help. With no fewer than 101 congregations, mostly located in more affluent communities, and clustered near I94 (a major artery leading into high-poverty communities throughout Chicago), Jewish congregations are in a strong position to take leadership roles and "point members to tutor/mentor programs that already exist, or to neighborhoods, where new programs need to be created." Please take a look also at the blog entry for Chicago's Places of Worship for more information on how this can happen, why it's so important, and how all faith communities - regardless of denomination or belief - can use the T/MC's strategies to increase the reach, frequency and consistency of tutoring and mentoring programs. Also, please visit the T/MC website to get information about T/M programs in all parts of the region. And, go to the T/MC Program Locator, or the Interactive Zip Code Map to find locations of programs that can use your volunteer or donor help. There are 78 known Episcopal Churches spread throughout the area. As you can see in this map, they are mostly located in more affluent areas, versus areas that are suffering from poverty. 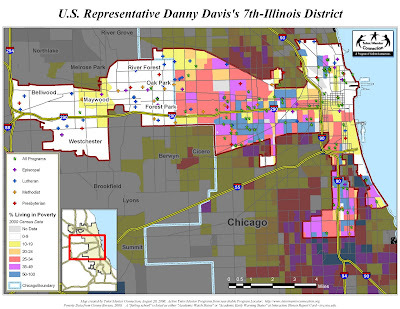 Episcopalians in these affluent areas can be tying "scripture and service, and pointing members to tutor/mentor programs that already exist, or to neighborhoods, where new programs need to be created." And please visit the T/MC website to get information about programs in all parts of the region. And then head to the T/MC Program Locator, or the Interactive Zip Code Map to find locations of programs that can use your volunteer or donor help. There are at least 454 Churches that consider themselves generally "Christian." Like the Baptist churches, many of these are located in impoverished communities. Yet some have more congregations in relatively affluent areas. In either case, church leaders can be be tying "scripture and service, and pointing members to tutor/mentor programs that already exist, or to neighborhoods, where new programs need to be created." We know of at least 325 Catholic Churches spread throughout the city - in impoverished neighborhoods, as well as more affluent areas. 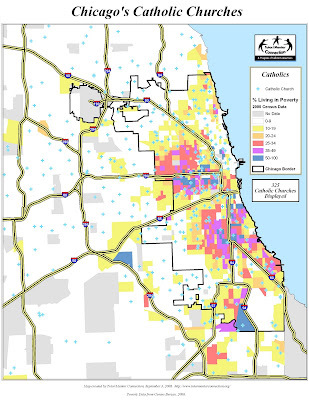 Catholics in more affluent areas can be tying "scripture and service, and pointing members to tutor/mentor programs that already exist, or to neighborhoods, where new programs need to be created." 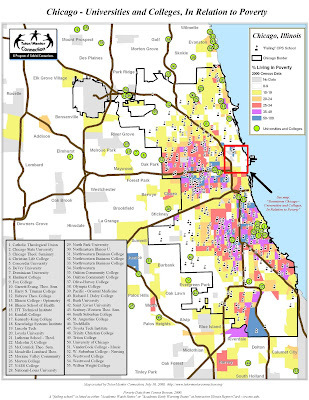 Please take a look at the blog entry for Chicago's Places of Worship for more information on why this is so important, and how faith communities can use the T/MC's strategies to increase the reach, frequency and consistency of tutoring and mentoring programs. And as always, please visit the T/MC website to get information about programs in all parts of the region. And then head to the T/MC Program Locator, or the Interactive Zip Code Map to find locations of programs that can use your volunteer or donor help. "Maps showing the location of Catholic, Methodist, Lutheran, Baptist and Presbyterian Churches in Chicago... show which are in poverty neighborhoods and which are not. We'd like to help faith groups develop evangelism strategies which would lead to a more active, and strategic, role of every church in every faith group in helping inner city kids be part of total quality, comprehensive one-on-one tutor/mentor programs." There are 960 known Baptist churches in our data, many clustered in high-poverty communities just off the highway arteries on the west and south sides of the city. Easily accessible for commuters, these are ideal locations for "faith communities to present a 'tutor/mentor message' at least four times a year, in their sermons, newsletters, and web sites, [which] can dramatically increase the reach, frequency and consistency of our call for help. " Please visit the T/MC website to get information about programs in all parts of the region. And then head to the T/MC Program Locator, or the Interactive Zip Code Map to find locations of programs that can use your volunteer or donor help. The Tutor/Mentor Institute has a document called "How Faith Communities Can Lead Volunteer Mobilization For Tutor/Mentor Programs." The document provides Tutor/Mentor Connection (T/MC) strategies for helping "faith groups develop evangelism strategies which would lead to a more active, and strategic, role of every church in every faith group in helping inner city kids be part of total quality, comprehensive one-on-one tutor/mentor programs." Ideally, "churches in affluent suburban areas, as well as in inner city areas, will be delivering sermons on a regular basis, that tie scripture and service, and point members to tutor/mentor programs that already exist, or to neighborhoods, where new programs need to be created." Because "getting faith communities to present a 'tutor/mentor message' at least four times a year, in their sermons, newsletters, and web sites, can dramatically increase the reach, frequency and consistency of our call for help. " Please visit the T/MC website to get information about programs in all parts of the region. And as always, please take a look at the T/MC Program Locator, or the Interactive Zip Code Map to find locations of programs that can use your volunteer or donor help. 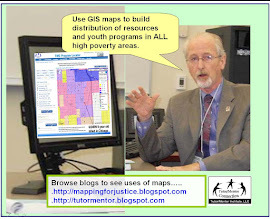 A continuation of this week's theme, today I want to show maps that show locations of tutor/mentor programs, alongside areas of greatest need in the fight against poverty. I haven't done enough of this, but I would love to direct you to the Tutor/Mentor Connection's extensive library of documents ... docs that offer analysis and strategy pertaining to tutoring/mentoring/collaborating, and ultimately addressing poverty and its effects, through tutoring and mentoring. Please take a look at the Tutor/Mentor Institute to learn more about why your participation through volunteering and donation is so important to the entire community. 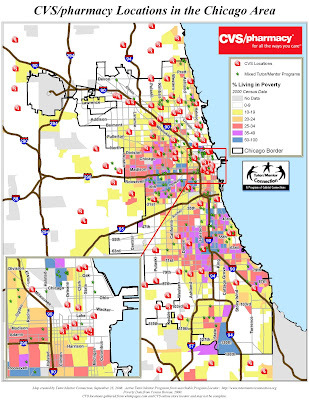 Here is a map that shows the locations of programs that work in a purely tutoring capacity. 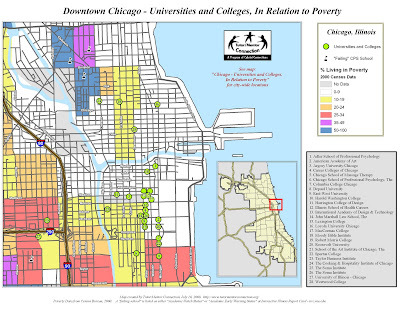 Here is a map that shows the locations of programs that work in a purely mentoring capacity. And here are programs that use a mixed tutoring AND mentoring strategy, similar to the one espoused by Cabrini Connections. Use the zip codes on the maps to find more information on a region of the city, either by using the Tutor/Mentor Connection's interactive zip code map, or their Program Locator. Our "failing schools" are overflowing with frustrated students... angry students... deperate students. I met a lot of them when I was working at Raby High School in Garfield Park... exceptionally bright kids with tons of talent and potential, about to give up on a system that has failed them for their entire lives. There is a real and open sense of "why even try anymore... I'm sick of being told I'm a 'failure.'" And this is a very universally human response. I bet you've felt that way at jobs, for instance, where you've been "set up to fail." But I'm not here (today) to discuss inequalities in schools or issues pertaining to school funding. And I'm not going to discuss (at this point) how sad it makes me that all this talent is about to potentially be wasted. What I'm here to do today is champion tutoring and mentoring programs... programs that are making a difference in the lives of kids - kids who will soon be frustrated, angry, and desperate adults. You don't have to go far around here at Cabrini Connections to find kids and parents who testify that the help they receive(d) through tutoring and mentoring programs have made the difference between failure in school, and scholarships to college... between safe and honest employment, and employment on the streets. And with that in mind, make no mistake - these programs don't just help the kids who participate. They help you. They help all of us. Are you concerned about poverty? Are you concerned about street violence? I am. What can you do? Well, I'm going to lay it on the line here. You can help a tutor/mentor program that is fighting poverty and its symptoms. How? Your time and your dollars. It's that simple. In fact, without your time and your dollars, these programs will disappear, and these problems that affect us all will rage on without anyone fighting at the front lines. Please take a look at the following maps showing the locations of Tutor/Mentor programs, alongside "failing school" data, to get a better sense of where your help is needed most. And then use the interactive zip code map or the program locator to learn how you can contact the programs and offer your help. Continuing the theme I started last week, I want to look at more maps that feature Chicago area programs that work with students in a tutoring, mentoring, or mixed capacity during non-school hours. However, unlike the last set of maps I posted, which show the locations of ALL known programs, this set of maps in this blog will filter the data by "age group served." In other words, what grade level are the kids at, in school? So how do you use these maps? What good does it do to see these clusters of stars? ... And that the major highways on most of our maps show potential volunteers how easily they can find a program alongside their normal commutes. But why else are these maps important tools? This exemplifies an important purpose for these maps. A quick trip to the interactive zip code map could show potential partners/collaborators where other programs are located - programs whose specialties complement the work they are doing. Equally important perhaps, these maps might highlight an absense of programs for a particular age group in a given neighborhood. In fact, this is one of the reasons Dan Bassill started Cabrini Connections in the first place. Seeing that Cabrini Green Tutoring was working solely with elementary kids, he recognized that the neighborhood's older kids needed a place where they could build on the important work Cabrini Green Tutoring was doing, and continue to develop their academic and job skills.